I think one of the reasons why the holidays are so comforting is the ritual involved in most of them. We grow up with things being done a certain way....comfort foods, the familiar tunes, smells, events and objects we hold so dear. With these traditions comes a sense of obligation....I remember that episode of Friends when they celebrate Thanksgiving and every single member needs their potatoes prepared a different way. In classic Monica fashion, she has a meltdown and caves under the pressure of needing to be perfect while accommodating every single person's tradition. Thanks to Pinterest, we are now also bombarded with images of every single tradition you "should" be doing. Now, don't get me wrong, I LOVE Pinterest, but it can be hard sometimes to distance yourself from it when all you see are amazing projects, meals and perfectly decorated homes. Pinterest holidays are simply NOT sustainable. For our little family, we have narrowed down a few outings and traditions that we will observe starting this week. Our list of events looks a little something like this: Canadian Thanksgiving with the traditional meal, Trick-or-treating on Halloween, Boo-ing a couple of neighbors, pumpkin patch, Family pictures, Fine Arts night at our school, American Thanksgiving with the traditional meal, ZooLights, Polar Express, Chinese food on Christmas Eve, Holy Day of Darkness. Our of our favorites is taking the kids to Zoolights. We've gone every single year since we started dating. It's so awesome to watch our family grow each year through these pictures! I don't stress about too much else. For us, the events as traditions trump the "stuff" traditions. I would love to be able to make everything from scratch, and have every shelf looking perfectly and have handprints/footprints of the kids each year. But the reality is, that's just not sustainable for me. So we focus on doing things that the kids will truly remember. One of the things I do intentionally do for Christmas time, is I purchase each of them a Christmas ornament....it's usually pewter. Of course when they move out and have trees of their own, they will take these with them. Last year, I also participated in December Daily where I scrapbooked a story each day in December. I loved it and I'm thinking I will do it again this year. You can bet that I'm planning that book out now so that I'm not scrambling at the last minute! Ultimately, YOU have to decide what's going to work for you. Trying to honor everyone else's traditions in addition to your own is a recipe for disaster. So today, think about which traditions are truly important to your family and see if it lines up with the type of holiday season you're trying to enjoy. Make sure that the pressure to get everything right and everything done doesn't get in your way of actually savoring and enjoying those traditions! I love the idea of ornaments each Christmas. This will be my son's second Christmas and we did this last year. I do love the pewter idea though!!! All my ornaments are Barbie and I do love them but my husband not so much haha! It will be nice that your children with have gender neutral items for their tree one day haha!! Love your posts so much on this challenge, thank you! Thanks! That was my reasoning behind the pewter...although it's easy for them to add up $$ quickly! I love the Lisa Leonard ones and the Vintage Pearl ones as well :-) Thanks so much for following along! 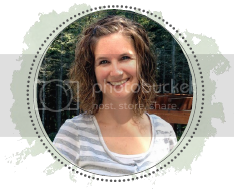 I'm so glad to have come across your blog through Beth's link up! Where in Canada are you from? I am from/live in Saskatchewan. I love your focus on doing things and making memories as opposed to buying stuff. That's actually been a huge theme of my year, learning to live more simply and intentionally.